• Never measure yourself. Get someone else to help you. and a t-shirt. Empty contents of pockets. Pull up pants for snug fit. Remove belt. Measuring Device (see below). Another tape will also be required for measuring. • Pull tape measure snug. DO NOT allow extra in your measurements. • This device is designed to assist you in obtaining consistent mea- surements. This is of utmost importance in order for us to make your Pants fit as it should. Use on measurements marked 6. • Secure the elastic belt part of the device around waist at navel. Make sure belt is parallel to ground. • The elastic should be a snug fit so it does not move up and down easily when you rotate the tape or slide the tape slider buckle. • You can now snap the tape to the tape slider buckle. 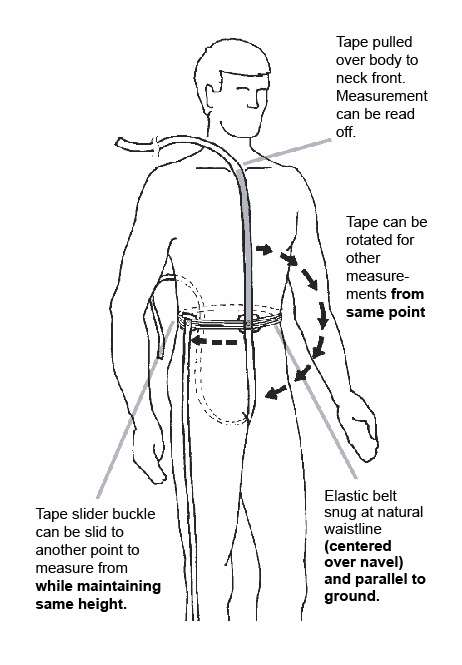 • Have someone run the tape over your body to the point you need to measure to, then write down the measurement. • Rotate tape for other measurements that are from the same point. For other measure from points, slide tape slider buckle. Make sure elastic belt does not move accidentally during measuring process.